To add insult to injury s9 and d3 miner dashboards don’t display actual hashrate and power consumption. It’s like a play dashboard to fool you. Try visiting their support website and open a feature request for these things you'd like to see them do? Doing that might get a little more traction than ranting on a forum that the Giga-Watt team doesn't read on a regular basis (based on their lack of posts here). It's also their official support website so it should be visible to them. I agree ZedZedNova, Giga Watt Token renting is for long term Hodlers who want pretty consistent passive income. And I really like how you get abit of different major crypto's BTC/ETH/LTC/DASH I haven't had and Zcash yet but you never know. My investment thesis with GigaWatt and WTT is that it provides access to electricity that is far less expensive than where I am physically located and for a long time. My investment in GigaWatt and WTT is long term, and I am not looking for an almost immediate 100% ROI. Yeah, I know, that's really strange in the cryptocurrency world where it seems that everyone expects to achieve a 100% ROI on every investment in three months or less. If and/or when that changes I will re-evaluate. My investment in WTT tokens is currently at +58% https://coinmarketcap.com/currencies/giga-watt-token/ and my return from token rental is 8.15% which annualizes to 38.63%. In the grand scheme of things, this is just fine by me. Oh please. Don't even start with that crap. This is not the forum for US government bashing. Go grind that axe somewhere else. Forgive me if this has been asked and answered - I couldn't find the answer so I'll ask the experts. If my Alpha needs 1,000 watts + 10% and I buy 1,100 tokens on EtherDelta, does that cover the electricity or do I need tokens PLUS pay for the electricity? Forgive me if this has been asked and answered, I didn't see it. You need tokens and to pay for the electricity plus maintenance. The tokens will cover the cost of "renting" space, but they do not cover the cost of electricity or the maintenance fee. That combined charge be paid for with your miner's earnings. I'm batch 4. No word on when they'll be issued other than 'soon'. I live in Washington state so I'm going to go on a tour there scheduled for Dec 6th. If anyone has any questions you'd like me to ask them I'll do my best (no guarantees) to get them answered. You should ask them what they are required to report to the IRS (if anything) for tax purposes about our mining payouts. For US citizens obviously. Can someone please explain it to me why the token price are so low even after this HUGE rally in the price of Bitcoin? I understand that the project is taking time which is quite expected for an infrastructure project of this size and scale but my reading is when this thing is up and running and the market realise the potential, token price will be quite high. Please share your views! If you buy to tokens to rent: You should receive about $0.35 per year per token as a rental fee. Buying during the ICO when price was $1.00 - $1.20 gives you a nice steady passive income of around 35% annually. If you buy the token on the secondary market for $2.50 your going to make the same rental fee but now will have to wait twice as long to break even. I don't think the price will go up too much because of that reason. Same thing if your buying them to put your own miner on giga-watt. If the tokens are too expensive your not going to get your money back from mining. For this type of project I don't think its a buy low sell high type deal. Its more of a buy low and put your mining equipment online or buy low are rent your token. Personally I'd love to see these tokens go down to 50 cents!! The highest I think it could go is maybe $3 or $4. But I nobody knows. I agree that the best case if to buy these tokens and put your miners. This will be most profitable and most of the people will do that and would want to do that. Having said that, this creates a demand for the tokens that are free and floating.? Can somebody (hopefully Giga-Watt representative) explain me why I can not send my own miner for hosting? I understand that 1 WTT token is supported by exactly 1 Watt of capacity. I hear people have problem renting tokens out - so there is free capacity. I bought tokens, batch 4, so potentially I am legit client. Their instruction says you need to have a miner AND tokens - then you are in line for deployment... How does rent exactly happen then? and their silence makes it appear as Ponzi... I am really getting concerned about my investment. Do they really have capacity they claim? Not trying to troll, really would like to know how renting (on receiving end) happens? Somebody says he rented out 70% - so 30% is still available- right? Was anybody able to host their by renting WTT? //Thanks for your inquiry and welcome to Giga Watt. If anyone wants my 33 s9 miners at giga-watt they can give me the 12.34 bitcoin I paid for them and their yours. Why are you selling them? They were due in October right? And now I have a pending email sent 12 days ago with no answer. I'm not in the FUD group, I still believe in this project but it's very frustrating to see I have 600 WTT and not all are being rented at 100% when I have a miner somewhere that no one can tell me. LOL... Sorry I couldn't help... you ask for the same amount ?! Di you see the increase since ? Is it 12 bitcoins or is it the $56K you paid for them? Price is low because of delays I think, so when people read numerous complain they may decide to refrain. But after the process launch in full speed next year price may rise. Also there were big buyers in pre-sale, who did not want to mine, and they are trying to sell tokens now. There are no GW representatives here. Due to delays and long deployment process it happed that currently there were more tokens issued than mining capacities working, that is why there are people with tokens who can't rent out 100%. I am about 15% of tokens not rented out, and rest is rented out. But this situation should change in December when most rigs will be deployed, and those who rent out now, will start using these tokens for themselves to mine. That is why GW says to you to come in January. They are not sure how thig will go, because there may always appear new requirements from US officials which may delay deployment again. Sure this is not a scam, and they will have all capacity declared when they will finish all PODs. Many people are already mining, including myself (though half of my miners are still not deployed, waiting for December). 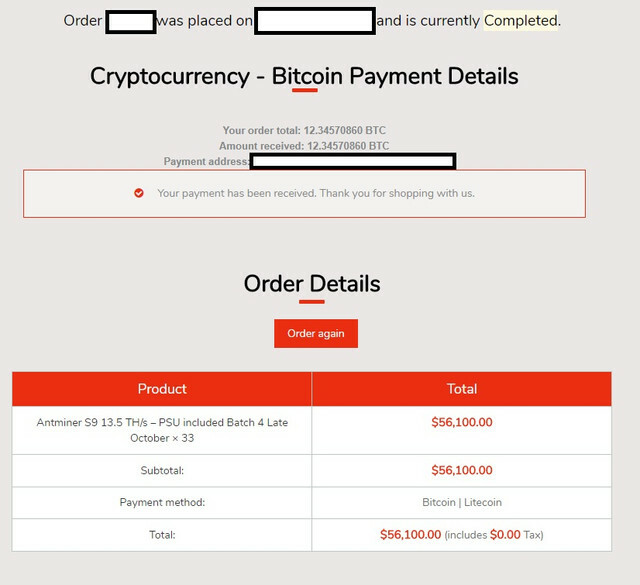 I have lots of tokens and yesterday took the leap and brought my first miner the Antminer L3+ due in December. I am super excited. I have been mining non-seriously on my GPU/CPU since 2013 but Giga Watt has made it easy for me to take the next step. I am so excited. What are other people using to mine at Giga Watt right now?